“When life itself seems lunatic, who knows where madness lies?…” from “Don Quixote” by Miguel de Cervantes, 1615. Don Quixote, a crazy middle-aged knight-errant from ancient Spain, is brought to life on the Brisbane stage by this celebrated ballet company from Milan. Giuseppe Conte dances the knight of the woeful countenance with aplomb. His interaction with his squire Sancho Panza (Gianluca Schiavone) gives a light comic touch but does not detract from the dignity of purpose embodied in Quixote. Prima ballerina Nicoletta Manni dances with breathtaking beauty the role of Kitri, a young woman in love with Basilio (Leonid Sarafanov). Her father Lorenzo (Salvatore Perdichizzi) wants to marry her off to the rich nobleman Granache (Riccardo Massimi). Quixote admires Kitri and sees in her his beloved Dulcinea. Manni and Sarafanove perform their various pas de deux with subtlety and virtuosity to the choreography of the legendary Rudolf Nureyev. Your reviewer had the honour in the early 1970s of seeing a number of performances by Nureyev at Covent Garden in London. Sarafanova was born in the Ukraine and is a principal dancer with the Michailovsky Theatre in St Petersburg, Russia. There is a touch of Nureyev about Sarafanova in his stage presence and his mighty leaps. The artistic depth of the corps de ballet adds a dimension to this performance. In the second act, one witnesses 17 female dancers advance en pointe to the haunting music of harp and violin. The composer Ludwig Minkus could not have wished for a better execution of his creation. The Queensland Symphony Orchestra conducted by David Coleman plays memorably. No windmill is safe from Quixote’s lance as he hurles himself into combat in the cause of love against the would-be foe. The sails of the windmill knock him to the ground where he is beset by gypsies who appear dressed up as monsters. Is this mere folly? Perhaps not. There is method in the madness. 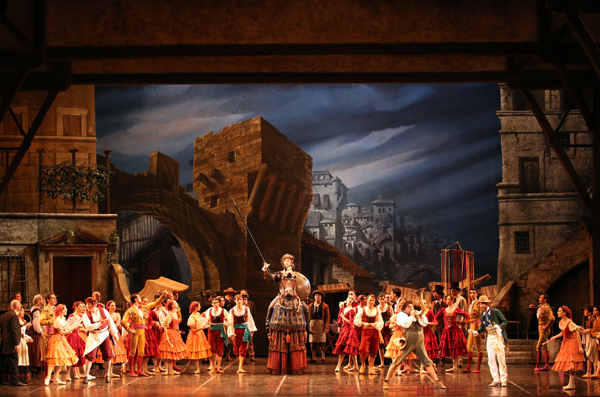 Quixote intervenes to support the young lovers Kitri and Basilio by securing the blessing of Kitri’s father, albeit aided by a little deception from Basilio. The disappointed Gamache (Riccardo Massimi) challenges Quixote to a duel but our hero triumphs and departs with Sancho Panza on further adventures. The La Scala Ballet delights and inspires us in this journey through love, delusion and nobility.